Some fascinating emails have come through my in-box over the past decade. One example arrived back in 2015 from Erica Sonnenburg, which led to this write-up shortly thereafter. Erica and her husband, Justin Sonnenburg, are researchers at Stanford where they study the collection of bacteria that inhabit our gut. It's called the microbiota. Her name struck me as familiar because the Sonnenburgs, both Ph.D.s, were included in Michael Pollan's article - Some of My Best Friends are Germs from May 2013. Her note went on to say they often cook recipes from 101 Cookbooks because many of them have the hallmarks of "good microbiota food". This immediately made me feel great, but also sparked many questions that have been dancing around my head ever since. When it comes to broad strokes, I get it. You want to encourage, nourish, support your internal bacterial community. The good bugs. And there are some general "best practices" in life that help. But, for me, the real, well-researched, specifics beyond that start to get increasingly hazy. I immediately wanted to know from her, which recipes exactly, and why? How exactly do I befriend and support my microbiota? How much does food impact it, and what are the other major factors? Best beverages - beer? wine? smoothies? In short, I wanted to know what sort of things I was doing in my day-to-day to support (or hurt) my unique-to-me friendly bugs, so I could continue to do more to support my microbiota. Erica went on to tell me about the book they were working on - The Good Gut. It establishes the case for the importance of gut microbiota, and documents their research and findings. They've done a lot of work to start to understand the role of diet in this realm, and what they're finding is that a diet rich in dietary fiber (plant matter) helps to keep the microbiota happy. Also, because different microbes feed on different things, diversity in your diet is key. Broadly speaking, you're after a wide range of beans, whole grains, seeds, and vegetables. And you'll want to consume foods rich in microbiota accessible carbohydrates. It's a fascinating read that goes well beyond dietary recommendations. They are doing the direct research into what makes your microbiota happy, and have some amazing findings based in good science. The back of the book includes a recipe section to set the tone for this type of beneficial food choice. 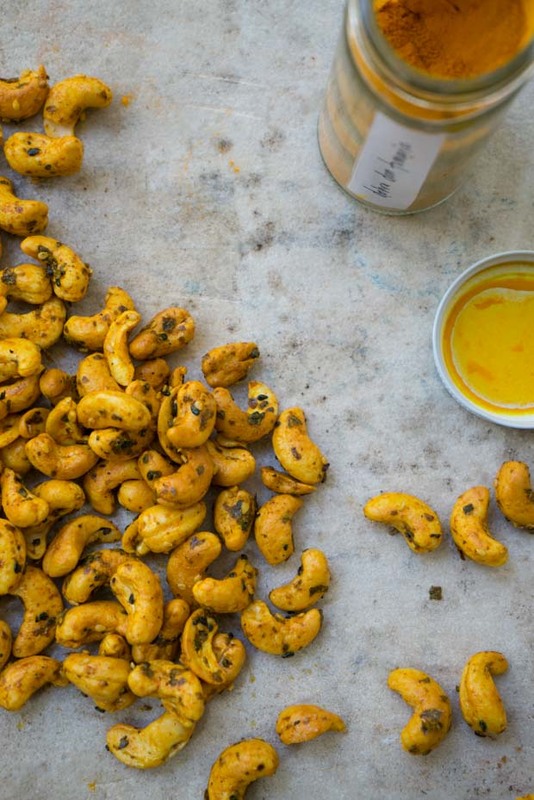 These turmeric cashews became one of my favorite snacks of the week. They're substantial and filing, and microbiota friendly. I used the recipe in The Good Gut as a jumping off point, and flared it out with a few extra spices. They were extra special because I used turmeric gifted by Tara (Seven Spoons) when I saw her last recently. She told me the turmeric is from her maternal grandfather's estate in Dehra Dun (Dehradun) in Uttarakhand, in the north of India - beautiful turmeric. 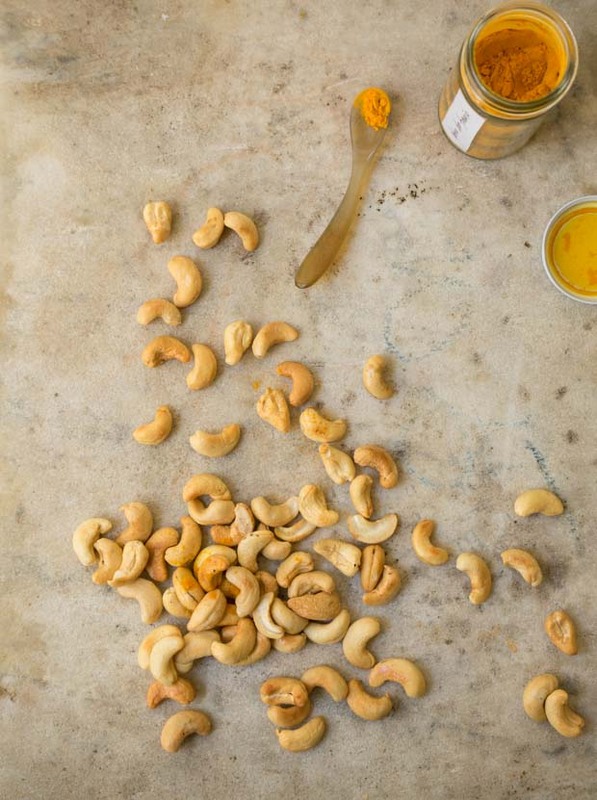 I've exhausted my turmeric supply from Tara, and fortunately I'm now able to source this special turmeric from Diaspora Co.
Toss the cashews with the sesame oil and sea salt and toast in a 350F oven for 5-10 minutes, or until golden, tossing once along the way. Remove and toast the seaweed for a few minutes. Allow it to cool and crisp, then crumble it. Combine the seaweed, sesame seeds, and cayenne in a mortar and pestle, and grind together. 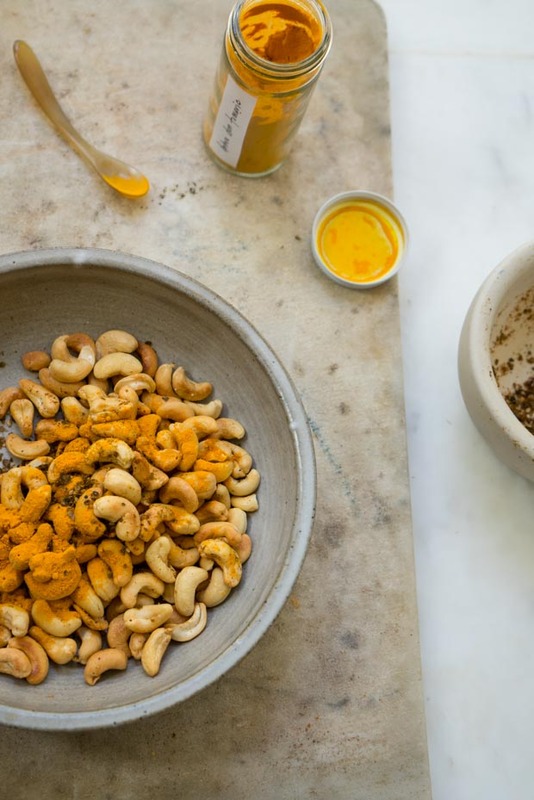 In a bowl (one that won't stain) toss the cashews with the sesame spices and turmeric, really go for it. If you need to add a few drops of sesame oil, do so to moisten things up a bit. Taste and adjust the seasonings, to taste.